On a beautiful late spring afternoon, this past year, a young woman received the devastating news. She had just gotten back her result on the Nail Technician Test. It was not what she had hoped for. In fact, it was not even close to the expectations she had considering her past experience and educational background. Then she remembered her friends and felt even worse. She did not look forward to having to tell them the embarrassing news, especially after she had boasted that it was no big deal. She had been procrastinating about taking the exam because she hated standardized tests, and this only confirmed her hatred. "What will I do now?" she thought with dismay, slowly realizing the harsh reality of her predicament and its upsetting implications on her future. Unfortunately, this hypothetical situation occurs all the time. Someone thought they were going to breeze through the examination, told all their friends, made plans for their future, and then got an embarrassing reality check from the Nail Technician Test. The National Nail Technology (Manicuring) Written Examination and Nail Technician Licensing Examination are quite simply an objective assessment of a test taker's requisite foundation of knowledge and skills. Nail Technician Test scores are used by the National-Interstate Council of State Boards of Cosmetology (NIC) and state licensing boards as a uniform standard of qualification. While it may not be fair, all of a person's plans for the future may be dependent upon needing a certain Nail Technician Test score. That is the whole purpose of the Nail Technician Exam Secrets study guide: to give test takers the keys to understand how to succeed on the Nail Technician Test. If you'd like to get the Nail Technician Test score you deserve, to quit worrying about whether your score on the Nail Technician Test is good enough, and to beat the test taking game so you can become a licensed Nail Technician (Manicurist), then this might be the most important message you read this year. Our comprehensive study guide for the Nail Technician Test is written by our test experts, who painstakingly researched the topics and the concepts that you need to know to do your best on the Nail Technician Test. Our original research into the National Nail Technology (Manicuring) Written Examination and Nail Technician Licensing Examination, offered by the National-Interstate Council of State Boards of Cosmetology (NIC) and state licensing boards, reveals the specific content areas and the essential skills that are critical for you to know on the Nail Technician Test. We've taken the information and developed a study guide that is guaranteed to help you be successful on the Nail Technician Test. Our company's name is Mometrix Test Preparation, and we have a team of standardized test researchers who have worked on developing our study guide for the Nail Technician Test. The standards for who gets to work on the team are very strict. We demand the best for our customers, and only those who met our exacting standards made the cut. The dedicated research staff have years of combined experience in mastering the content and skills necessary to succeed on the toughest exams. Some academic studies have revealed that test takers do not really benefit from the traditional test preparation process. But we knew there had to be a solution. If test takers were not doing well on the Nail Technician Test despite high intelligence, there had to be a set of secret keys to the test that would open the door of success for these test takers. We believe we have succeeded in finding the secret keys of the exam. What we found was surprising, and in some cases ridiculously simple once explained to the average test taker. We put the findings together in a thorough, concise study guide that we believe allows any test taker, at any skill level, to improve his or her results dramatically with a minimum of effort. We created the product in part because we were frustrated by the options available to test takers who really wanted to do well on the Nail Technician Test. A common approach is to TEACH the material, instead of TEACHING THE TEST. That's not necessarily good enough for the Nail Technician Test. You have to know how to apply the knowledge. Most test takers already have a general knowledge of the material that will be covered on the exam. 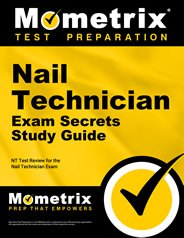 One reason some test takers do well on the day of the test is that they have made the critical connection between the material they learned and how to use the material to succeed on the Nail Technician Test. Our guide addresses the difference between merely knowing the material and knowing how to use the material to perform on test day. Keys to questions that give away the wrong (or right) answers. You get credit for some of the questions just by paying attention to how the question is asked. Get quick, customized help for the questions you have about how to use our materials. Just send us a quick email and we'll get back to you promptly with the answer. Details the EXACT STUDY PLAN for the Nail Technician Test that we believe gives the most results in the least time. No matter if you're studying for a week or a month, you won't waste the precious study time you have on useless activities. Our researchers are more than just academic theoreticians who understand the technical nature of standardized tests, but are also experts on test taking itself. They reveal the exact skills and the information you'll need to perform under pressure during the test. Learn why, when, and how to guess to your advantage. Many test takers use exactly the wrong strategy, but you can avoid the pitfalls with the help of our standardized test experts. Includes instructions detailing the best way for you to get started with your preparation efforts so you can begin the path of improving your scores immediately. The most efficient and accurate method for picking the right answer. You won't be scratching your head trying to read the mind of the test question writer, but will instead know exactly what to look for to pick the best answer. Courteous, unlimited customer service is 100% free. If you need the product emailed to a different address, lose the product, or have any other difficulty, the help you need is just a short email away, and our representatives are active 7 days a week helping customers. The research of our team of test experts is 100% independent and original. Our exclusive calibration strategy to help you never go too fast OR too slow when answering even the toughest questions. The 5-step process we've developed, what we call the phased approach, concerning the use of the various study aids and practice tests. How to structure your preparation to avoid the problem of procrastination that can kill your chances of success. The most important things you should take care of within 24 hours of taking the test. Make sure you've taken care of the little things in addition to studying hard. How to predict the right answer before you see the answer choices, and how to prevent the wrong answers from polluting your mind and tempting you into a trap designed by the test writers. Why answers that sound correct are often the very ones that are wrong and how to tell the difference between the right answer and the many clever-sounding traps set for you by the test writers. Our benchmark method for deciding which of the answer choices you should pick. How some of the random bits of information in a question often give away the right answer choice. How to milk the question for clues to the right answer even if you aren't sure what the question is asking about. How to avoid panicking when you don't know the answer to a question. We offer a systematic method that will serve as the lifeline you need to minimize the time wasted on the test questions that leave you stumped. What to do about the tough questions that you have no clue how to answer. Don't just give up, use the advice we offer to make sure you give yourself the best chance of getting the right answer. How to use our brainstorming method to get inside the question and reveal the hard-to-find clues and some of the subtle things you didn't realize you knew. Do you know what a hedge phrase is? Learn why looking for the key weasel words in the question can help identify the correct answer. The secret to using the contextual clues in the questions and the answer choices to make important distinctions between the right and the wrong answer choices. How to avoid careless mistakes by using the quick double check system. It will more than pay for itself relative to the time it will take you. Why extreme statements in the answer choices are dead giveaways for wrong answers. Find out how to detect the subtle differences between reasonable answers and the answers that are almost always wrong. Learn how to group your answer choices into families that often narrows down the pool of correct answers. This is a quick way to immediately eliminate one or two of the answer choices and increase your odds of getting the question right. Now, you're probably wondering how and why we can do all the things we claim. Before we go any further, let us clarify what Nail Technician Exam Secrets is not. It is not a stale rehash of all of the things you have already learned in the past. Nail Technician Exam Secrets is our exclusive collection of the tips and the information that we have specially selected to give you the best results on the Nail Technician Test for the least time spent studying. It's written in everyday language and is easy to use. We cover the essential skills necessary to do well on the Nail Technician Test, plus comprehensive reviews covering all of the essential test sections individually. Listen to what our customers say about other Mometrix test preparation products. I purchased the Secrets file, and I just wanted to let you know that I passed my test. I just want to thank you again, and hope you have continued success in your ventures. Sincerely, Paul L.
My name is Chris. I used the Secrets study guide for five days. The study guide made the test so easy to understand. Like you said this program is worth 100's of dollars. To me 1,000's!! THANKS, Chris G.
I heard about your website from a friend. I am enrolled in a review course, and in hindsight, I wish I wouldn't have taken my review course and instead spent a fraction of the money on your program. Thank you! Zac L.
One: The guide must be written by writers who have painstakingly researched the topics and concepts needed to succeed on the Nail Technician Test. The blind cannot hope to lead the blind. Two: The guide must be written in easy-to-use everyday language so all test takers can access the information. Three: The guide must be to-the-point, with no fluff to distract the test taker from the truly important information. Four: The guide must address the test first, the material second. If the material was the only thing that was important, then every test taker that understood the material should get a perfect score. That doesn't happen because there's a difference between simply knowing what's on the test and the way you perform on the test. You want a study guide to close that gap. Five: The guide must motivate the test taker to actually study for the exam. If the guide is hard to read, the time spent studying will be slow and painful, and the results will be meager. Six: The guide must be guaranteed. If you don't pass with flying colors, you get your money back, no questions asked. You get at least 10 times your money's worth! When you consider what's at stake with the exam, we believe the value of our study guide gives you at least ten times your money's worth. plus all of the other special tips and secrets we have included to help you prepare for the exam. Nail Technician Exam Practice Test Questions: Think you're ready for the Nail Technician Test? Test yourself using our practice test questions. Find out if you're prepared or if you need to head back to the study guide for another review. Use our practice test questions to make sure that you're not caught off guard on the day of the test! Our Nail Technician practice test questions give you the opportunity to test your knowledge on a set of questions. You can know everything that is going to be covered on the test and it will not do you any good on the day of the test if you have not had a chance to practice. Repetition is the key to success and using the practice test questions allows you to reinforce the strengths you already have, while improving the weaknesses that you need to overcome. Detailed answer explanations are included for the questions. It may sound obvious, but you have to know which questions you missed (and more importantly why you missed the question) to be able to avoid making the same mistakes again when you take the real test. That's why the practice test questions we include for the Nail Technician Test include answer keys with detailed answer explanations to each question. The in-depth answer explanations will allow you to better understand the questions that were difficult for you or that you needed more help to understand. Study Skills teaches you everything you need to know about studying, so that you can maximize the effectiveness of the time you spend in preparation; the techniques provided are guaranteed to get you the results you deserve on the day of the test. Study Skills is the most in-depth, comprehensive study manual available and is completely free with the purchase of Nail Technician Exam Secrets. How to Overcome Test Anxiety: Do you get really nervous the day before important tests? If so, you could be suffering from a mild form of what's known as test anxiety. The report we include gives you some of the latest important research into test anxiety, including our exclusive tips on how to make the test-taking experience as stress-free as possible while maximizing the score potential you have. We insist that you order Nail Technician Exam Secrets entirely at our risk. That's why when you order from this site it comes with a Risk-Free, 1-year 100% Money-Back Guarantee. There's absolutely NO RISK on your part. Why are we going to such great lengths? Even though we are absolutely confident in the quality of our study manual and its ability to help you get the results you deserve, we want to completely eliminate the possibility of any remaining doubts or concerns. So go ahead and order your copy of Nail Technician Exam Secrets today. Take the time to read it, use it, and profit from it. If you use any one of our secrets, and somehow fail to recoup your small investment in the form of the test result you want, send us an email at support@mometrix.com to arrange a 100% refund of the product price. Now let us take the guarantee one step further. If you don't like this exclusive book for ANY reason, you can return it for a 100% refund of the product price. And remember, this is a 1 year guarantee. You're free to return it at any time, for any reason, up to one year after the purchase date, no hassle, no questions asked. We're sick and tired of good people losing opportunities because of the score they get on a test. A good test score opens doors, and when the door doesn't open, dreams and ambitions die, and we think that's a horrible thing. If you think there's even the smallest chance that this material will help you, you owe it to yourself to try out our product. Don't let fear or doubt stand in the way of what could be the best opportunity you have to achieve the test score you need to fulfill the dream you deserve. What we're saying is, don't decide now if the product is for you. Just get it and try it out. If it doesn't do everything we say and more, if you don't save time, money, and frustration, if it isn't what you thought it was, if it doesn't work for you, you have nothing to worry about when you order from this site because you can get every dime of your money back under the no-loopholes guarantee. So you have nothing to lose and everything to gain. Here's how to order right now! Nail Technician Exam Secrets can be ordered directly from this site. A printed copy will typically ship within one business day from our shipping facility. Or, if you prefer, you can order the study guide as an instantly downloadable ebook. It doesn't require any special software. If you can read this web page, you have all you need to start using and applying Nail Technician Exam Secrets in just five minutes. You don't have to wait for anything to come in the mail. Download Nail Technician Exam Secrets immediately! Both versions are the same price and contain the same information. If you need instant access and are comfortable with ebooks, order the ebook. If you would prefer the physical book and can wait for the product to arrive in the mail, order the printed book. It's easy to order your copy of Nail Technician Exam Secrets. The entire comprehensive package retails for $72.99, but is available to you today at the incredibly low price of $39.99. Just click one of the links below. If you have any problems or questions, please send an email to support@mometrix.com and we will be sure to get it working for you. If you would like to order through the mail, click here to order Nail Technician Exam Secrets study guide by check or money order.